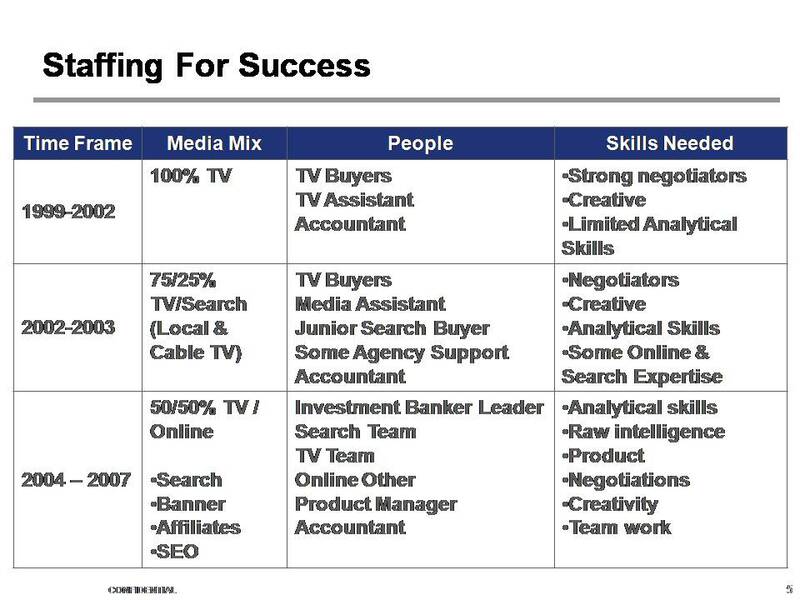 1) Strong Quant Skills: As your team is balancing multiple media – offline and online – strong quantitative skills are critical in terms of balancing the media mix and determining the effectiveness of your media buys. Historically, an individual attracted to media buying was not a naturally mathematically inclined. Today’s media buyers and media managers must be able to make the trade-offs between different media based on quantitative metrics and results. Trade-offs need to made on cost per acquisition versus volume of acquisition, local versus national media spend, brand exposure between pure direct response. Balancing all these demands can be challenging. Managers must be able to give media buyers clear direction and goals. Media buyers need to be able to analyze results and communicate to managers why they are choosing the media mix they have. 2) Balance: Advanced media teams have always had to purchase multiple media – maybe print, TV, radio and maybe outdoor display/billboards. The Internet has multiplied the number of places that a marketing team can advertise – search, banners, pop-unders, roll-overs, sponsorships, and more. Every media team needs to be cross-trained in negotiating, purchasing, and managing traditional media types as well as the new media, particularly search. I find most online advertising to be far simpler to implement and manage than the traditional media due to transparent pricing and limited creative options. A the same time, marketing teams that are able to efficiently use print, TV, and radio will do well since the actual implementation of the campaigns is a barrier to entry for competition. 3) Clear Communicators: With more media alternatives, it is critical for media managers and media buyers are able to clearly communicate WHY they have chosen to execute and test various campaigns and HOW those campaigns performed. Media managers and media buyers also must communicate potential threats and opportunities to senior management – threats include increased competition or increased pricing from publishers; opportunities include new media or reduced pricing opportunities as well as buyer power in publisher relationships. 4) Embracing Experimentation: The Internet has increased competition at every turn. Media need to consistently experiment with new media and new creative to keep pushing the boundaries of what is known. With every media business, costs increase to reach the marginal eyeball or consumer. Thus, it is important to consistently increase the reach of your message. Buyers must also embrace the “scientific method,” which we all learned in high school. Media buyers must test new media (channels, times, days, segments, behaviors) and new creative implementations while holding as many constants as possible. Then, test, measure, refine, and repeat. 5) Growth through Creative: The creative implementation matters a lot. Smart quantitative media buyers are very good at optimizing the buys. Buying smartly with the same creative implementations will get you only so far. Regularly testing and pushing your creative implementations is necessary for every media business. You can be surprised at the results. 6) Familiarity with Product Management: Search is becoming an important part of your media mix. A strong marketer will understand the implementation of good natural search / search engine optimization strategies as well as the dynamics of social networking. Though there are good consultants to help with search engine optimization and social media strategies, having a strong familiarity with search engine optimization and social media will help in identifying the right tactics to drive additional consumer awareness of your products.